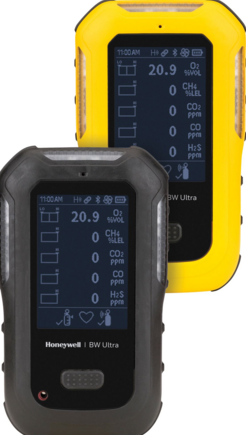 Honeywell has launched a new connected portable gas detector designed to keep workers safe in dangerous confined spaces. The new Honeywell BW Ultra monitors up to five different gases simultaneously, including volatile organic compounds (VOCs), while leveraging Bluetooth connectivity to allow safety managers to collect and track valuable data. The new detector also features Honeywell TouchConnect technology, which makes configuration, calibration and bump testing fast and simple. The BW Ultra was designed using the Honeywell User Experience, which puts customer problems and ease of use at the centre of the development process. The new detector features a larger 3.2-inch display to show more critical information at a glance, an ergonomic design, and a one-button operation. TouchConnect technology helps users quickly access calibration and bump test modes and complete configuration changes without the need to be connected to a docking system or a computer. BW Ultra connects the safety manager to a data ecosystem. Data from the detector or its IntelliDox docking station is downloadable to a PC, where it can be aggregated and managed through Honeywell’s Connected Worker software platform to simplify and speed up compliance tasks. A cloud-based network option will be available soon.